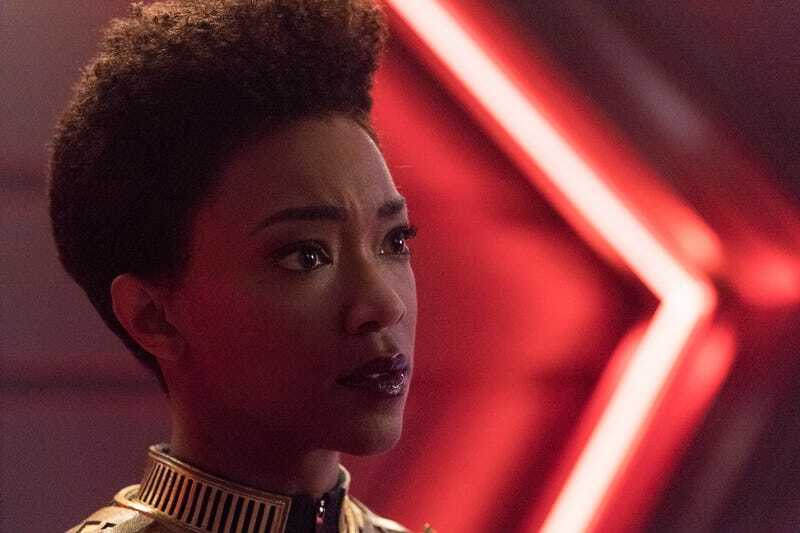 Michael Burnham is not having a good time in the Mirror Universe. This is not a huge surprise; Michael Burnham hardly ever seems to have a good time. (Admittedly, we’ve rarely seen her outside of unfortunate circumstances.) Early in tonight’s episode, she talks about the challenges of surviving undercover as an evil version of herself, wondering how long it’s possible to submerge all that’s decent in your personality without losing a piece of your soul. It’s a serious, well-performed monologue that leads to an emotional exchange with Tyler, her lover and confidant. Tyler gives his own monologue in his efforts to reassure her, calling Burnham his “tether” to the world and offering himself as a possible connection to everything she feels she’s had to leave behind. Forty minutes of our time later, everything falls apart. Tyler’s realized his true identity—yes, he’s really Voq, so we don’t have to talk around that anymore—and whatever feelings he might have had for Burnham have been subsumed in the return of his original personality. The two fight, and I think it should be upsetting, and it sort of is. But it’s frustrating as well, because like so much of what happens on this show, it feels like a plot development that was planned without any understanding of how these characters work or why they make the decisions they make. I can grasp the facts of Voq’s ruse (going deep undercover to get information on the Federation’s most important ship), but the larger implications elude me. It’s the sort of twist you get when you build a show out of moments without regard to, well, connections. That, I think, is my biggest problem with Discovery. The serialization has created a narrative in which events happen less because they’re built to or earned, but because it was decided in advance that the show needed a Big Twist. Tyler-as-Voq does go a long way towards explaining why he suddenly became a major figure after such a curious introduction; he needed to be important in order for the reveal to have any impact at all. Lorca made him chief of security and Burnham fell for him because if he’d just been been some random dude in the background, it wouldn’t be as dramatic when the truth was finally discovered. Yet that sort of ends-justify-means approach to character ends up feeling hollow in the long run. Both Lorca’s decision and Burnham’s affections should’ve felt more like natural evolutions of established relationships, instead of the plot outline checkmarks that they actually were. The actors worked to sell the material, and the limited number of characters at least made the romance more plausible (who else was Burnham going to hook up with? ), but the writing isn’t really supporting them. Right now, we’re just jumping from Twist to Twist, and that’s not really sustainable. Still, judged on its own merits, “The Wolf Inside” has a fair amount going for it, including strong performances, considerable style, and the usual lightning fast pace. 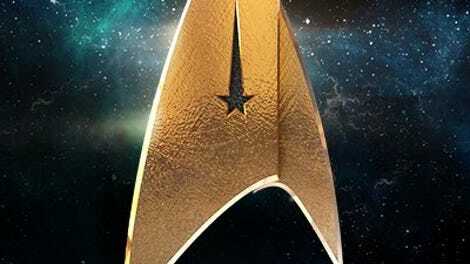 In the span of forty plus minutes, Burnham loses her closest ally; meets (and inadvertently betrays) the head of the resistance (Voq) and has a run in with her surrogate father; finds a way to get information on the Defiant back to the Discovery; and learns that the mysterious evil Emperor of the Terrans is the parallel universe version of her dead mentor, the much missed Captain Georgiou. It’s a lot. And in the episode b-plot, Tilly tries to save Stamets and seemingly fails, only for Stamets’ mental projection to wind up in Spore Central, where he meets his Mirror Universe double. So yeah, this one brings the bombast, and even if it doesn’t all add up to much, it still plays well as an episode, bouncing from moment to moment like a house afire. While the Tyler reveal isn’t as powerful as it could’ve been in the grand scheme of things, it’s well-constructed in a basic but effective way; we’re reminded of the strength of Burnhman and Tyler’s bond in a way that makes it even more important in context, and then we see that bond disintegrate before our eyes at the worst possible time. It’s a relief to have this all out in the open as well, and the fact that the show didn’t delay it any longer is almost certainly for the best. While I still don’t enjoy the Mirror Universe enough to want to spend that much time in it, at least the writers found a way to make that time relevant. Burnham’s decision to contact the Resistance leaders to both warn them and also determine how a Klingon could’ve risen to a leadership position over such a disparate group fits in character, and while it’s a bit goofy that she runs into Voq and Sarek, well, that’s the sort wackiness you always get in parallel universes. Since we’re presumably not going to stay here forever, and thus don’t have the time to develop a whole new cast of characters, it makes sense to keep drawing from the same well of familiar faces, especially seeing as how the main appeal of this whole concept is the thrill of established characters in unexpected roles. Which is why it’s not hugely surprisingly that the Emperor is who she is. I’m delighted to have Michelle Yeoh back on the series, however briefly her return might be, although this is really the sort of twist that would’ve played better a few seasons down the road. As it is right now, it feels like the writers are rapidly burning through every potential shock they’ve got on hand. The result is a show that’s often thrilling to watch but somewhat hollow in retrospect. The franchise history helps to fill in some of the gaps, and the cast is at the very least game for the experience, but without anything deeper to get invested in, you have to wonder why we keep making the effort. Lorca’s accent seems to get thicker after he gets tortured a lot. Tyler is briefly off the hook for Culber’s murder after Stamets and the dead doctor are discovered in Sick Bay and the crew draws the wrong conclusions. So that’s one bit of seemingly sloppy writing that turns out to be more clever than I expected. I went back and rewatched this a couple of times, and I still can’t figure out how in the hell Burnham was able to send a message back to the Discovery about Tyler’s real identity. I didn’t mention this in the review proper as I’m almost positive I missed something, but so far as I can tell, she was never alone long enough between the attack and the “execution” to have conveyed the information to Saru. Speaking of Saru, his double manages to save the day when Tyler-Voq overwhelms Burnham.